Regular upkeep is a crucial part of maintain any complex mechanical system. Your automatic garage door certainly qualifies. There are many moving parts that are involved in its operation, and they all need to be in top shape in order to prevent a lot of malfunctions and keep the system operational for a long time. Our team can provide you with regular service appointments that willhelp to ensure that. 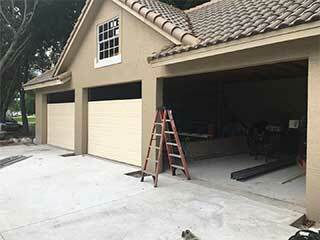 To see to it that your garage door won't close while there's a person or an object underneath it, the opener's safety features need to be tested. Our technicians will make sure that the photo eyes are aligned correctly and that their lenses aren't scratched or otherwise damaged. If the alignment of the safety sensors isn't precise, we will reposition them, and even replace them completely if we find that they've become damaged somehow. The parts of your door that counterbalance the heavy weight of the panels need to be closely examined for deformations. Garage door springs are under a lot of stress on a daily basis, and they will bring your door to a screeching halt if they break. Not to mention, dealing with a broken spring can be incredibly dangerous, so it's a type of scenario that's best avoided. We will make sure these units are properly lubricated and that their tension is well adjusted to keep their performance both smooth and efficient. As the components that facilitate the straight and steady movement of the door, the tracks and rollers can also do with some regular servicing. Our experts will lubricate the rollers to keep their movement silent. We will fix dents and bends in the tracks, and even realign them if their fastening screws have become loose. Don't just wait for a spring to break or for your opener to fail. Give our team at Garage Door Repair Big Lake a call today and join many other local homeowners who benefit from our regular maintenance service appointments.